Booklet with notes in German, English and French. 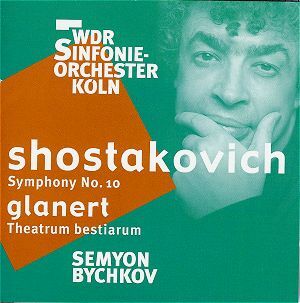 Where have I come across a Russian conductor with the WDR Symphony Orchestra, Cologne, in Shostakovich? Of course, the highly-praised Rudolf Barshai set of the symphonies, available complete on Brilliant Classics and in part on single discs from Regis. Semyon Bychkov’s own recordings with this orchestra have been appearing at intervals: Nos. 4 ,7 (Leningrad), 8 and 11 are advertised in the booklet for the present CD. 4, 11 and the present CD are hybrid SACD recordings, though packaged in a normal square-cornered case, rather than the round-cornered cases usual for SACDs. The WDR Symphonie-Orchester of Cologne comes over on those Barshai recordings very creditably, especially when one considers that the recordings were made live. If anything, now that Semyon Bychkov has been their director for over twelve years, they are a match for the very best, Karajan’s well-drilled Berlin Philharmonic in their two recordings of this symphony not excepted. Here on Musicweb Gwyn Parry Jones welcomed Bychkov’s recording of the Leningrad on AV0020, as did Colin Clarke, albeit with several important reservations. At least CC agreed that Bychkov had the makings of a fine Shostakovich interpreter, but I tend to align myself more with GPJ’s more positive view. The only thing which now seems odd about GPJ’s review is his statement that Avie/Bychkov recordings were ‘streaming forth’. The stream seems to have slowed down; at this rate Bychkov’s Shostakovich cycle will take as long to complete as Ashkenazy’s. In my recent review of the complete box set of Ashkenazy’s recordings I compared his version of No.10 with Neeme Järvi’s. My allegiance to Järvi (CHAN8630, with Ballet Suite No.4) remained unshaken, but I thought the Ashkenazy one of the best of an uneven cycle. In some respects that may be due to the fact that I now consider the Tenth to be Shostakovich’s masterpiece: the Fifth may be the more overtly appealing but the Tenth was the first in which Shostakovich was truly free to express himself. I liked the way in which both Järvi and Ashkenazy bring out the Mahlerian elements in the long first movement: it isn’t just the length that reminds me of Mahler, there are definite hints of the Resurrection Symphony, even an echo of Mahler’s setting of Der Mensch liegt in grösster Not. (Mankind lies in the greatest need.) Bychkov has already established his Mahlerian credentials with his version of that composer’s Third Symphony which Colin Clarke thought had much to recommend it, though not his first choice. Tony Duggan recommended Bychkov’s Mahler 3 highly in his comparative review: ‘triumphantly top of the pile’ among digital recordings. All three conductors take this movement at a leisurely enough pace to let it make its point: Järvi takes 22:59, Bychkov and Ashkenazy, by an incredible coincidence, both weigh in at 23:10. (The metaphor is deliberate: this is a weighty movement). Remember that Shostakovich began and completed this symphony in the year of Stalin’s death, his first symphony for eight years. Thus 1953 marked a rebirth for Russia in general and for creative artists like Shostakovich in particular – hence, perhaps, the echoes of Mahler’s Resurrection Symphony. Ironically, Prokofiev, who had suffered from proscription almost as much as Shostakovich, did not live to see that rebirth; he died the very same day as Stalin. In the first movement it is as if the ice has not yet begun to thaw; mankind, at least in Russia, is still suffering (in grösster Not, in grösstem Pein, ‘in the greatest need, in the greatest torment’, to quote Mahler again). Stalin had dominated Russia and the Soviet bloc for so long and so completely that people wondered what would happen next; as I well remember, the fear at first was that something terrible would ensue. Rightly, as I believe, all three interpretations reinforce this weighty view of the opening movement, though on repeated hearing I now feel that Ashkenazy lets the tension drop a degree too much in places; both Bychkov and Järvi maintain the tension much better. All three are well played and well recorded, making honours about even here: perhaps Bychkov’s ice seems by a small margin the thickest and most impenetrable. In the second movement, Allegro, Bychkov is a tad slower than Järvi and Ashkenazy but all three conductors convey the energy of this movement well. The energetic opening comes over very well, with Bychkov, his players and the engineers resisting the temptation to emphasise the insistent percussion at the expense of the turbulent strings. Volkov’s possibly spurious Memoirs indicate that this second movement is a musical portrait of Stalin; to my ears it sounds much more like the turmoil which followed his death, when the Soviet officials did not know what to do, not even daring to announce the death for some time. In the Allegretto third movement Bychkov strikes a balance between Ashkenazy’s very slightly rushed tempo and Järvi’s rather deliberate one. All three have problems with the points where the dance rhythm sinks beneath the surface – perhaps the fault lies with Shostakovich here for allowing the listener’s attention to wander, or perhaps Shostakovich was still hinting at the uncertainty of the times. The finale seems to mirror the whole symphony as it moves from the Andante opening to the Allegro section. Notoriously cryptic about his music, Shostakovich merely said of the Tenth that it marked the return to human feelings. At the beginning the freeze is still potentially menacing and the feelings are still in check; by the end even Shostakovich himself, present in the music since the third movement, and now more openly, in the form of his D-S-C-H motif (D-E flat-C-B in German notation) has joined in the dance, though rather hesitantly and stumblingly. There is general agreement about this movement, with Ashkenazy and Järvi coming in a few seconds on either side of Bychkov’s timing. The playing throughout the finale and, indeed, throughout the symphony, is excellent. Forget any ideas that this is a mere provincial radio orchestra. The wide-ranging Avie recording helps, of course, though it is equally true that the better the sound quality, the more potential there is for flaws to be revealed. Ashkenazy’s version was made with the RPO at a time when they were not at their best and Järvi’s Scottish National Orchestra are not usually reckoned one of the world’s greatest. Both, however, play very well: if the WDR players have the edge on them, it is not by much. Couplings may well be decisive. Ashkenazy is currently available only in a box set; if the individual CDs were to be made available separately, his coupling is the Chamber Symphony. I much prefer this work in its original String Quartet form but it is a generous coupling and it comes first on the CD. Järvi’s coupling, the Fourth Ballet Suite, is a rather inconsequential piece and it is most inappropriately placed – who wants to hear this work hard on the heels of the symphony? Of course, it can be programmed to play first, but that is a nuisance. Bychkov seems to have a penchant for coupling mainstream symphonies with the works of contemporary German composers: his Avie recording of Mahler’s Third Symphony is coupled with York Höller’s Der ewige Tag. There is a school of thought that recommends interspersing concert performances of mainstream music with the odd contemporary piece. I’m not sure that I endorse it, especially on CD: faced with two equally good versions of the same symphony, I’m sure that most people would choose the one with music by the same, or a similar, composer as a filler. Detlev Glanert’s Theatrum bestiarum was premièred at the 2005 Proms in this mixed-menu fashion, in a programme which began with Lyadov and ended with Stravinsky’s Fairy’s Kiss: I’m not sure how the presence of the Glanert and Oliver Knussen’s Whitman settings affected attendance that night. This music is several degrees more avant-garde than Shostakovich, even though the work is dedicated to him and the composer, in an interview printed in the booklet, draws comparisons between himself and Shostakovich. For someone who was born in Hamburg and grew up in West Germany to compare his own regime with that of Stalinist Russia seems rather to stretch the point. When I read the interview, I thought at first that Glanert must have been brought up in East Germany. The music seems to me to have more affinity with Stravinsky – shades of the Rite of Spring in Part 3 – than with Shostakovich; Glanert’s perceived problems with the establishment would, therefore, have more in common with the commotion which Stravinsky caused than with the mortal danger in which Shostakovich potentially stood. Carnival of the Animals it definitely ain’t, and I can’t imagine that it is likely to be hailed as a masterpiece in time to come. I know that contemporaries said that about Beethoven’s Late Quartets – I can even see why they said it – and maybe I shall be proved wrong at some future date: to me it seems to make a great deal of noise to no real purpose. Theatrum bestiarum receives a vivid recording, with its extreme dynamic range well captured. The same is true of the CD as a whole: the opening of the Shostakovich arises naturally, as if by some natural development. If the effect is marginally less magical than in Ashkenazy’s version, where the music seems to emerge from near-inaudibility, the difference is marginal. All three recordings, Chandos, Decca and the new Avie, are what the old pre-Penguin Stereo Record Guide would have marked with a D for ‘demonstration-quality’. The sound throughout is truthful, wide-ranging and well-focused, equally at home on both of my systems: it was neither too bright on the one nor too bass-heavy on the other. I didn’t note any of the problems to which GPJ refers in his review of the Leningrad – the artificial sheen and the moments of congestion. The climaxes are handled very cleanly and no part of the orchestra is emphasised at the expense of another. Even in stereo the sound-stage has a convincing degree of depth, which SACD can only serve to enhance. The notes in the booklet are informative, though the English translation is rather stilted. Nowadays German sleeve-note writers can be relied on to offer more idiomatic English than the old DG sleeve-note which exhorted readers to use ‘special clothes to clean this record’, but it still helps to have a native speaker make the translation. "Other than that of his much revered Gustav Mahler, Dmitri Shostakovich did not openly display his emotions ..." would have made much better sense if it had been rendered "Unlike his much revered Gustav Mahler ..."
I note that Bychkov is becoming something of a pluralist, having just released an impressive Hänssler Profil CD of Rachmaninov’s The Bells and Symphonic Dances: my fellow Musicweb reviewer Terry Barfoot thought that this CD eclipsed Neeme Järvi’s version of The Bells. I have a feeling that, with a little more acquaintance, his Shostakovich 10 will also replace Järvi as my preferred version. Bychkov’s version of Shostakovich’s problematic Eleventh Symphony (AV2062) is now the version of choice on many lists. This version of the Tenth, a much more central work in Shostakovich’s output, certainly ranks very high in my estimation. Give me a little longer to come to terms with the Glanert Theatrum bestiarum coupling, the only real obstacle to my nominating this as the best Tenth on the market. If you don’t like the coupling, you can always ignore it – which is what I tend to do with the Ballet Suite on the Järvi version, anyway. In any case, both Karajan versions are devoid of coupling and even some full-price versions, for example the recent Günther Herbig on Berlin Classics, are offered alone. Whichever version you choose, don’t be tempted to economise with this symphony: if you must go for less than full price, let it be Rostropovich on mid-price Warner Elatus 2564 61568-3, highly recommended on Musicweb by Michael Cookson, or one of the mid-price Karajan versions on DG. None of the Naxos Shostakovich symphonies is really recommendable, but the Rahbari version of the Tenth has received unwarranted praise in some quarters. Andrew Litton’s bargain-price twofer of Symphonies 6 and 10 (Delos DE3283) is as highly regarded in some quarters as his version of No.10 is regarded as too superficial by others. I don’t think this set has been reviewed on Musicweb, but I note that Colin Anderson found Litton’s account of the Fifth Symphony unexceptional but too circumspect and Gwyn Parry Jones also thought it uncompetitive. Adrian Smith, on the other hand, recommended Litton’s version of No.8 very highly.